Aside from the unique needs of each specific country to cope with its hydro-meteorological hazards, their NMHSs, generally speaking, are likely to have common (similar) basic needs to fulfill their core operational responsibilities to their societies. It becomes quite clear that #4, the GFCS, requires the involvement of staff within an NMHS whose experiences and expertise are rooted in the social sciences. Thus, crosscutting general invariant needs can be identified across all NMHSs. Unique needs of an NMHS (NMS or NHS) must also be identified and tailored to cope with each country’s specific hazards. Having done so a country’s list of its core (basic) invariant needs can be evaluated with whether those identified needs are being met in the real world. Efforts to modernize the US National Weather Service (NWS) have been called for and then embarked on over the past couple decades. In 2012 a published National Academy of Sciences report reviewed efforts undertaken toward the modernization and reconstruction of the US NWS. A study of this report could provide instructive input into modernization efforts because it noted successes and shortcomings in its decades-long modernization effort. It showed that even a well-to-do, resources-rich country encountered constraints in meeting its basic invariant needs to serve society. The following list was drawn from the Lessons Learned section (Chapter 5) of that NAS report. 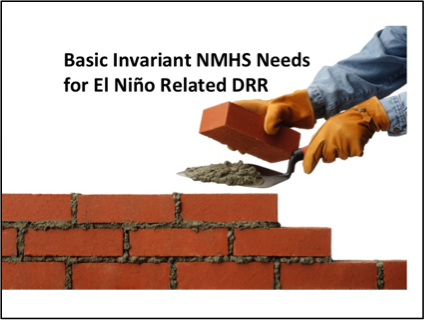 The list is meant to be illustrative and not definitive of what might generally be needed by an NMHS to work toward developing an El Niño ready nation. “The fact that they [lessons] are common makes it even more important that they be considered in future planning” (NAS, MAR, 2012, p. 73). Do the NMHSs have the tools (technology, personnel, expertise and institutional culture etc.) to meet those basic needs in order for each one to fulfill its responsibilities to its society? Do they have as yet the “absorptive” capacity to use the advanced technologies and techniques to effectively meet at least those essential needs? A checklist of explicit, all-encompassing needs by an NMHS can provide the needed capacity to create an El Niño Ready Nation. It would be best for the NMHSs (and NMSs and NHSs) to identify their own basic needs. From those we can identify the truly basic invariant needs of all such national services. This section of a proposed El Nino Ready Nations (ENRNs) website draws heavily on the reports of the World Bank Group’s Global Fund for Disaster Risk Reduction (GFDRR) and of the WMO. 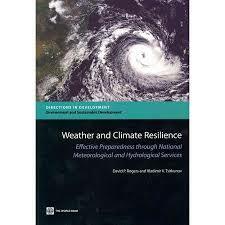 In fact the book by Rogers and Tsirkunov (2013) entitled “Weather and Climate Resilience: Effective Preparedness through National Meteorological and Hydrological Services” provides a lot of information about the state and needs of NMHSs in order to bring their services to societies up to early 21st century standards. The opening statement of this book succunctly captures the GFDRR/WMO concern about NMHSs today and the need for modernization efforts in the future. The statement above about the inadequacies of a piecemeal approach to modernization is valid but only in situations where piecemeal efforts at modernization are not part of a larger plan that leads to a modernization of the entire NMHS. Otherwise piecemeal efforts might be like applying band-aids to serious wounds as a one-off, temporary stopgap measure. “Modernization in parts,” however, is offered as a piecemeal approach but one as part of a master plan with appropriate priorities and schedules for upgrading activities. Modernization efforts today apparently seek to upgrade NMHSs by bundling together (an holistic view) all of a country’s hydromet threats/hazards that could conceivably affect a country over a long period of time and then modernizing the NMHSs to meet all of the challenges associated with that bundle of hazards. However, reading various documents related to modernization exposes the reality that not everyone sees modernization of the NMHSs in the same way. (1) ‘Facelifting;’ improvement, refurbishment, rejuvenation, renewal, upgrade, streamline. Thus, to those who see modernization as being focused on maximizing the scientific capabilities of an NMHS, it may refer only to achieving the state of the art levels of technology and training. Yet, what a technologically oriented service might view as its important needs for saving lives, livelihoods and property, policy makers might not. But modernization could also refer to upgrading or strengthening existing levels to higher levels but not to the best level possible (e.g. “satisficing”). It could refer to bringing an NMHS to a mutually acceptable (passable) “good enough” level of technology and capacity to meet minimum standards. Who is in the best position to determine if an NMHS is “paying its way” in a society by enhancing societal and environmental well-being? What is the ideally modernized NMHS, as visualized by the GFDRR and to the WMO? Practice will surely differ from what can realistically be achieved. Such a view may be correct when dealing with a technical system in which the various components are interdependent, such as the technical aspects of an early warning system. However, I discovered an interesting notion in a political science book “Peace in Parts.” The author of Peace in Parts, Joseph Nye, was focused on using regional political organizations to reduce interstate conflicts in a given region. He called for region-focused peace efforts in a regional conflict situation and going after a resolution by using the desired amount of force (resources) to win the conflict. Efforts are focused on a specific conflict, place, and time, as opposed to a general, well meaning pursuit of “World Peace” aa a hoped for but distant, ever out-of-reach, objective. To focus on peace worldwide among 200 nations would end up spreading already scarce resources so thin as to have little effect on resolving any conflict situation. The idea of “El Niño ready nations” is similar in intent to Nye’s “Peace in Parts.” It provides a logical way to modernize an NMHS in parts. It involves focusing on a set of El Niño-affected countries or regions measuring their vulnerabilities to common (foreseeable) El Niño hazards. [NB: If successful, the next concept would be applied to “La Niña ready nations.” A similar approach can be taken using our La Niña ready nations website to continue pursuing NMHSs modernization in parts. La Niña is the “cold phase” of the ENSO and it spawns a different set of anomalies around the globe. 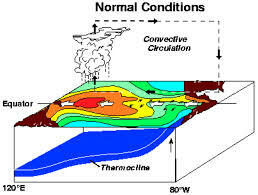 Because El Nino events occur 1/4th of the time and La Nina events another 1/4th of the time, focusing on them can go a long way toward modernization. Modernizing NMHSs is a process with many elements and complex feedbacks. Many countries (mainly in the El Niño prone regions) already have structures and systems created to cope with El Niño regardless of the level of development of its NMHS. In these cases readiness could be reached even before an NHMS modernization process is developed. The important point is that El Niño ready nations, weather ready nations and the NHMS modernization have strong connections because they are a part of the same process.